CS LOXINFO Review 2019: Is CS LOXINFO a Good Hosting? CS LOXINFO provides both Windows and Linux-based website hosting. However, their lack of overall features makes them only suitable for personal and certain small business websites. Beginners should look for a different provider with more robust functionality in their hosting packages. CS LOXINFO has been in business since 1994. They started out as an internet and telecommunications service provider, but have since branched out into providing web hosting services to thousands of companies in Thailand. Their hosting services are suitable for many personal and small business websites, but the features are somewhat limited. Also, this is not a suitable provider for beginners due to their lack of convenient website building tools. I really like the fact that the storage for databases and email are separate from the primary storage. Some providers share your email and database storage with your primary storage, which can cause problems. One thing that’s somewhat disappointing about this provider is that they don’t have much in the way of advanced features. They don’t offer advanced developmental tools or advanced server access, such as allowing for Cron job scheduling. Also, if you’re a beginner looking for help building your website, you’re not going to get it with this provider. They don’t offer any form of website builder or auto-installer. That is somewhat disappointing because their features are more attuned to basic and beginner websites. If you’re experienced, you’ll be able to use the Plesk control panel to upload your files and install your preferred CMSes. I’m not a fan of the 100, 500, 1000, or 3000 plans due to the low storage capacity and the fact that they only offer you a single database. If you want to install WordPress, you won’t have any other databases left. Even the highest-tier plans only offer two databases. However, the database storage space is separate from your domain storage, so you don’t have to worry about a massive database eating up your storage allotment. Note that these plans are all for single domain hosting. You won’t be able to host multiple domains without signing up for multiple accounts. Also, they don’t offer free domains or SSL certificates, so that’s two additional charges for many websites. CS LOXINFO offers decent customer support consisting of phone support, email, and ticket support. Their call center and email channel for web hosting is only open from 8:00 a.m. to midnight ICT. Unfortunately, they don’t offer live chat support or a knowledge base, meaning you’ll be forced to contact them directly for answers to most problems. CS LOXINFO would be the perfect entry-level provider if they offered a website builder and auto-installer. They do provide reliable services for basic websites, but limits on databases and the lack of advanced features make them unsuitable for larger websites, including many e-commerce businesses. 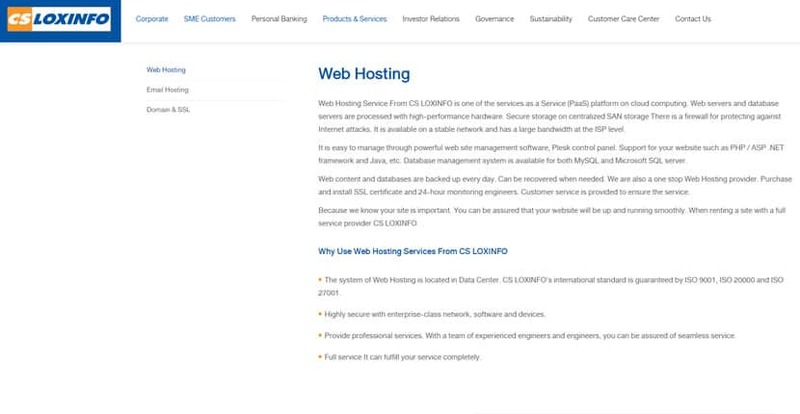 Wondering how CS LOXINFO stacks up against other Web Hosting companies? Enter any other Web Hosting company and we will give you a side-by-side comparison.